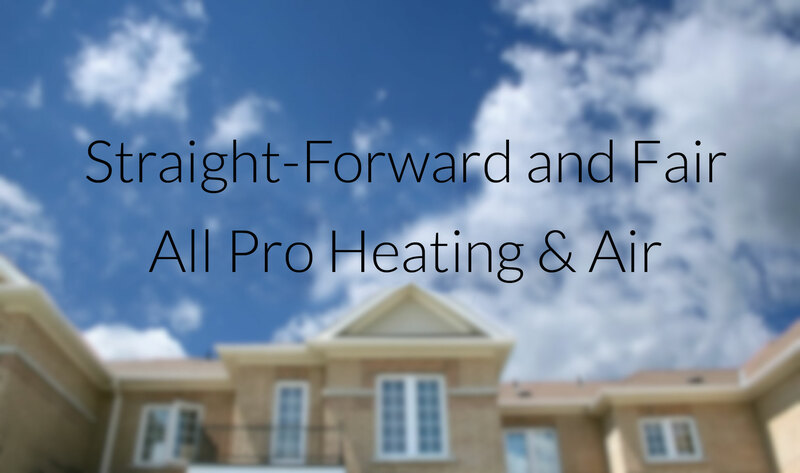 Expect more from All Pro Heating and Air. Expect the technician to arrive on time, to be courteous and respectful of your home, your time and your family. We will perform an eighty two point inspection of your HVAC system. We will analyze the cause of the problem and provide you a system performance report. We will give you options with straight-forward pricing to address the most critical issue and get you HVAC system working again as well as recommendations for keeping your systems in top working efficiency. Very impressed! When I called this morning with an A.C. issue, Constantine answered the phone right away and was here in a little over an hour. I would highly recommend! What can I say about this team and Constantine, the owner? Our 40 year old Air conditioner went out on Thursday night. I called All Pro Heating and Air Conditioning on Friday morning and by 10 AM they were at my house helping to determine if we could even repair the old one or if we needed to replace. We already knew what Constantine confirmed. It is too old to effectively repair. Luckily the weekend wasn't too hot and by Monday at 6pm, we had COLD air pouring out of the vents into the house. Hallelujah you guys rock!! By the way, I had called another service provider that same Friday morning. We had used this other company before but they wouldn't even come out to see us until Thursday 7 days after we called. All Pro Heating and Air was done 3 days before the other company would even come out to our house. Thank you again. Perfect service! Nice to work with! Highly recommended! Very nice guys, they saved us during hot summer by fixing our AC in few hours!!!!! !